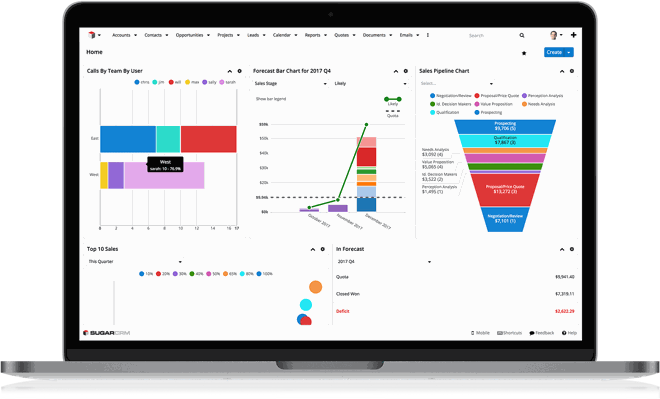 SugarCRM customer management software makes customer relationships extraordinary by optimizing business processes. The software exists in several versions which makes it possible to offer users several functionalities available depending on the version used. The 3 versions of the software are Sugar Professional, Sugar Enterprise, Sugar Ultimate. The professional version of SugarCRM software is intended for companies that want to grow. This edition is mainly intended for small companies. Sales automation and forecasting, for the management of contacts, tasks, customers, activites and quote. Customer service and case management, for the management, processing and follow-up of client cases as well as access by clients to a knowledge base. Lead management and sales campaigns, for lead management and lead management campaigns. The enterprise version of SugarCRM software is intended for companies that want to grow. this edition is intended for larger companies. Advanced workflow with the definition of processes and rules and the possibility of creating automatic email templates. The Ultimate version of SugarCRM software is intended for companies who want the most complete CRM software. It offers the basic functionalities of SugarCRM + Sugar Professionnal functionalities + Sugar Enterprise functionalities and and additional features regarding storage and instance of sandbox. Ask our SugarCRM expert consultants for more information on editions, features and prices.